The NY Times has graced us again with a look at how to spend your weekend. This time, it takes us to Buenos Aires. Being one of Latin America’s largest cities, there is too much to do in 36 hours. This would be one of those moments to choose quality over quantity of things experienced. I checked out the list and I can honestly say I have not done, eaten, seen one thing on it. Yet, the itinerary definitely nailed some “must-dos”, like a football match — preferably the Boca Junior against their infamous rivals River Plate — and Graffitimundo, a tour of the spray-painted streets in Buenos Aires. Undoubtedly, if you are only in the city for a weekend, you may want to change your sleep schedule. As the article suggests, and I agree, porteños like to party all night long and it’s an experience you will not want to miss. This article tends to focus on two neighborhoods in Buenos Aires: Palermo and Recoleta. Just as an addition, or perhaps a swap if time does not permit, I would have drinks at 878 in Palermo (Thames 878), a former speakeasy, which radiates relaxation and ambiance. For some reason, some bars in the city jack up the lights, which makes it very uncomfortable to drink and have a conversation at the same time. However, 878 does everything right. From low lighting to leather sofas, it is very comfortable spot to finish off the night. In Recoleta, I am surprised that Milión (Paraná 1048) did not make the list as a bar to experience. The bar is three floors in an old, European-style mansion. You feel like you just walked into a fabulous party a hundred years ago, except for the 80’s music, which I love. You would never guess it looking from the front, but the bar boasts an impressive garden patio, also lowly lit, in the back. You truly feel like a million bucks. However, I do have some issues with what one can really do in 36 hours in Buenos Aires. Palermo and Recoleta are wonderful neighborhoods, but if you are spending a weekend in B.A. you have to check out San Telmo more thoroughly. Although I can’t attest to some of the recommendations on the list, I think the following should trump most meaty-meetings. Some of the best parilla — grill — I had was at a spot called Desnivel (Defensa 855). Order the bife de chorizo and don’t let the grumpy servers get to you. Outside of the Plaza in San Telmo, there are some restaurants that are the best kept secrets, not that the Argentines don’t want to share. Cafe San Juan (San Juan, Av. 450) has amazing entradas, appetizers, that leave you whirling with wonder and waddling home. Just a few blocks over you have Lezama (Brasil 359), frequented by Ricky Martin when he’s in town, which could be a big deal if you wanted it to be. Nonetheless, whatever the decor lacks, the parrillero makes up for with buttery steaks. 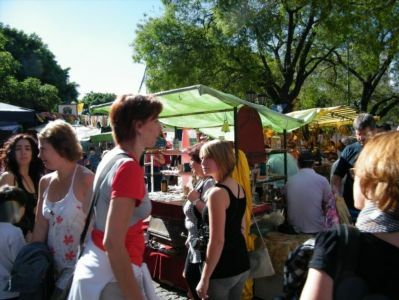 Not to mention the Sunday markets in San Telmo are packed with artists, musicians, vendors, orange juice makers, antiques, and lots and lots of people. You could spend a whole day or just a couple of hours, but it’s definitely a must see. Alright, I just deleted ten paragraphs of interesting spots to hit in the city. I guess you really do need more than 36 hours.